This is a common, small, colonial, ground-nesting bumble bee. The female (worker) bee is 5 ⁄16″ to ½″ long. The thorax and abdomen are densely covered with short hairs. The thorax is mostly yellow with a conspicuous black T-shaped mark. There are six abdominal segments. The first and fourth abdominal segments are yellow, the second and third are orange, and the fifth and sixth are black. The head is black with a few yellow hairs, especially around the base of the antennae. The tongue is short. The queen is similar but longer and plumper. The male (drone) is similar but has longer hairs, a yellow head with a few black hairs, and yellow on the sides of the fifth and sixth abdominal segments. Red-belted bumble bee (Bombus rufocinctus) has a black dot, not a T-shaped mark, on the thorax. Honey mixed with pollen and nectar of flowers. Pollen and nectar of flowers, especially flowers of blackberries, raspberries, goldenrods, blueberries, bilberries, and milkweeds. In April the queen emerges from hibernation and searches for a new nesting site. A suitable site is typically a small rodent burrow or a natural crevice in the ground. After locating a site the queen will forage for pollen and nectar to feed her future offspring. She then lines the nest with a waxy substance that she secretes, lays eggs fertilized in the previous season, and incubates the eggs. After the eggs hatch the newly emerged larvae, all female workers, pass through three stages before pupating and finally emerging as adults. The workers assist in expanding the nest, foraging for food, and incubating the eggs. The queen continues laying fertilized eggs throughout the summer. In late summer she begins laying unfertilized eggs which will develop into drones. In early fall the queen lays the last of her fertilized eggs. These develop into queens. The new queens forage for food, build up body fat, and mate with drones. In mid-fall the old queen and the rest of the colony dies, leaving only the new queens. The queens overwinter individually under a few inches of loose soil or leaf litter. Bumble bees will sting to protect themselves or their nest. The stinger is not barbed and the bee can sting multiple times. 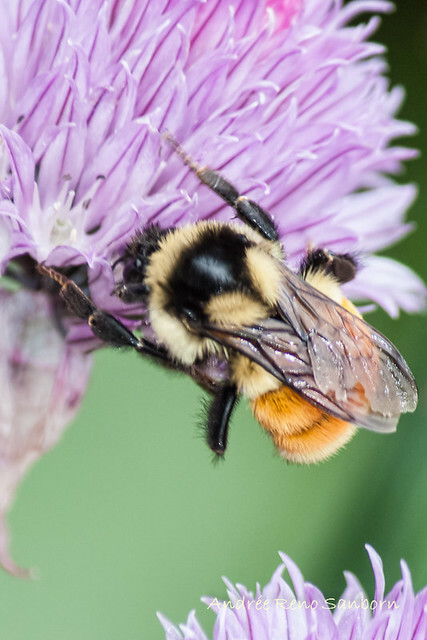 Elaine Evans, a PhD candidate in the Department on Entomology at the University of Minnesota, the University of MN Bee Lab, and BefriendingBumblebees.com have published a handy identification chart of Minnesota bumble bees. Handy, that is, for entomologists. Indispensable for amateur naturalists in Minnesota or anyone wanting to identify the bumble bee in their photo. Click on the images below to download the PDFs. Orange-belted bumbles are preferring Goldenrod over coneflowers. At the bee fest. There is a pretty good sized Bull Thistle patch near where I live that the bees and butterflies are working pretty hard. There were quite a few Tri-colored Bumbles working the Tansy patch. Hooray! Fertile Queen Bumble Bees finally emerged from their long, long, long winter's nap this week! Photographed at Grand Forks, North Dakota (06 May 2011). Photographed at Grand Forks, North Dakota (14 August 2010). Photographed at Grand Forks, North Dakota (12 May 2010). Collecting pollen on grass weed seed.